With infra3D Services you are comfortably on site and very well-informed without being there physically! Many administrative processes are greatly simplified. Time-consuming and dangerous field inspections belong to the past. Be on site - Save time & money, and work safe. This week we are on the road in Altdorf bei Nürnberg (Bavaria) to capture georeferenced, high-resolution and 3D images of the entire road network of the municipality. The infra3D service is used as a basis for various legally prescribed tasks, in particular for planning purposes as well as for inventory and condition analyses. Today we are on the road for the Zentralbahn ZB to update the 3D image data of the ZB rail route Alpnachstad - Meiringen - Interlaken Ost. The captured data will be processed, georeferenced and integrated into the existing infra3DRail service of Zentralbahn. On behalf of the cantonal administration, last week we've captured the Rheintunnel in Basel. Purpose of the driving campaign: high-precision 3D images of the road corridor and the integration of the laser scanning data (3D point cloud) into the existing infra3DCity service. James Patrick joins our team as a geoinformation experte. Welcome aboard, James! Today and tomorrow we are on the road in Jetzendorf (Germany) to capture georeferenced, high-resolution and 3D images of the entire road network of the municipality. The infra3D service is used as a basis for various legally prescribed tasks, in particular for planning purposes as well as for inventory and condition analyses. We are pleased to announce that our infra3D Release 3.8.0 is now available online. This release brings many new features. For more information please see the video tutorial HERE. On behalf of the cantonal administration, last week we've captured a road section of the canton of Zurich. 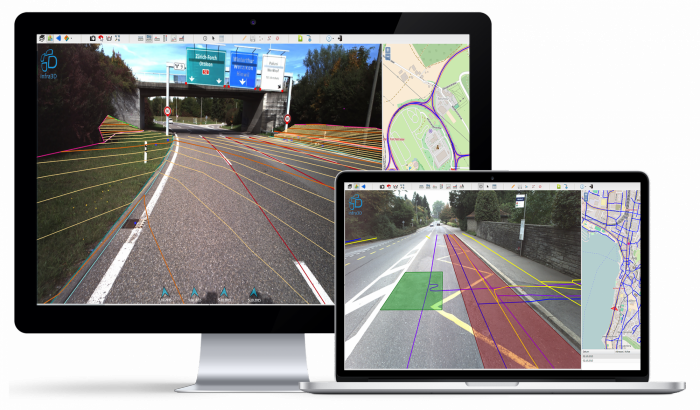 Purpose of the driving campaign: high-precision 3D images of a cantonal road section (between Teufen and Irchel am Berg) including metrological evaluations of the roadway geometry for traffic safety reports. Another Swiss canton relies on our infra3D service as an efficient infrastructure platform. On behalf of Canton Schwyz, our measuring vehicle is capturing this week hight-resolution, georeferenced and 3D images of the whole cantonal road network. Expensive and time-consuming field inspections can in the future be conducted directly via computer screen. On behalf of the cantonal authorities, over the next few weeks we will capture images of the city of Basel, and of the municipalities of Riehen and Bettingen. The purpose of the driving campaign is to update the data of the infra3D Service (data updating of the road network). The new captured images will be integrated into the existing infra3D Service. Another Swiss railway operator relies on our infra3DRail service as an efficient infrastructure platform. On behalf of Swiss South Eastern Railway (SOB), our measuring vehicle captured this week georeferenced, high-resolution and 3D images of the entire rail network of the SOB. Visit us at the 18th International 3D Forum in Lindau on May 7 and 8, 2019 to learn more about the new features of our innovative infra3D platform. We are looking forward to your visit! infra3D Service simplifies infrastructure maintenance, the management, planning, realization and documentation of construction projects. Many work processes, particularly structural and operational maintenance of your infrastructure systems require a wide range of spatial data. Conventional extraction of the relevant data is time-consuming, expensive and often entails risks or operational restrictions. The infra3D service allows you to collect this data efficiently and flexibly, direct from your work place. The infra3D Service provides you with an high resolution, georeferenced 3D panorama imagery of road and rail corridors directly to your workstation or into your tablet. Using web or mobile client you will be constantly well informed about your infrastructure. Our infra3D image database facilitates measurement with centimeter precision. Our service achieves the highest measure accuracy standards in digital surveying. These exact georeferenced online-inspections can reduce the amount of on-site inspections by 60 %. infra3D is completely cloud and web based (password-protected) imagery application with an accessibility 24/7 from anywhere. The platform is very intuitive, easy to understand and work with – Measurements can be performed with the unique monoplotting (one-click) technique. infra3D Service is flexible: sector-specific configurations allow you to adapt the service precisely to your needs. The power spectrum of infra3D covers the demand of different guarantors (public & private). The service is used in many different infrastructure applications. The infra3D Service can be integrated & combined with an existing third-party solution (GIS or CAD's). Particular geo data can be accurately displayed, overlaid and presented in its actual context through in infra3D Service. Many infrastructure operators, public administrations and engineers here and abroad trust the unique infra3D service and use our intelligent infra3D geo image data service for their various purposes.